On the road again! This time to look at some of the art encountered on my travels as I went on many occasions northwards. The most striking road art piece I came across in Co. Monaghan is by the artist David Annand who took his inspiration from one of Patrick Kavanagh’s poems, Come dance with Kitty Stobling. 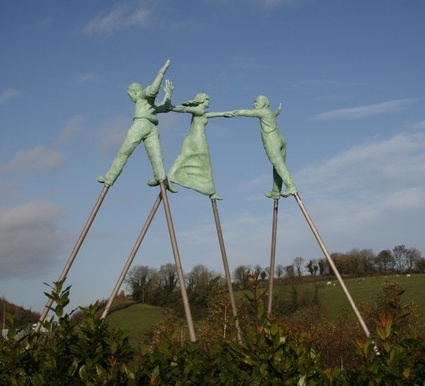 He created the sculpture “Dancing at the Crossroads” (2005), which is located on the N2 Carrickmacross bypass not far from Inniskeen, the poet’s home place. Three dancers are swirling spiritedly on high stilts and reaching out for each other’s hands. I love the dance movement portrayed, as it is both elegant and confident. This sculpture was designed to be well visible and in keeping with the poem- cavorting on mile-high stilts. The old tradition of crossroads dancing was a popular social event in Ireland up to the 1950s, when people would walk or cycle to a main crossroads and meet up to set dance. Further up north, a stunning piece, Polestar (2006), by Derry artist Locky Morris is made of 104 telegraph poles and galvanized steel. 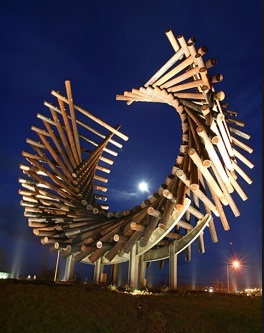 This 12 metre high wooden structure can be seen in Letterkenny, Co. Donegal, at the Port Bridge roundabout. This site is historically significant as trade and goods would land by boat and be transported to the surrounding areas by rail and road. Transportation played a major part in the town’s development in the past. Although abstract in form its internal structure and logic are intended to make strong visual reference to the former railway line and bridge that once operated along the site. The use of telegraph poles is a direct reminiscence of the electrification of rural Ireland programme from the 1930s and the fact that those poles would have been dispatched through the Port of Ballyraine. The linear shape of the wooden poles is suggestive of railway tracks, bringing to mind the vital rail transport system, which existed then in Donegal. Indeed steam-powered trains would travel on the various railway lines, including the Strabane-Letterkenny line back in the 1910s, delivering goods to the communities as well as transporting people to their chosen destination. Imagine traveling up to Donegal by train through the mountains; what an adventure! I think the circular sweep of the structure is spectacular and the interlocked pattern simple yet intricate. The sculpture refers, as its name suggests, to a pole star. Indeed, this star is prominent and bright and has a fixed position. According to Locky Morris, it is a star to be steered by, something serving as a guide. He believes this to be a rich dynamic statement that will hold its own as a new landmark within the Letterkenny area and I am inclined to agree. As you are approaching Newry on the A1 Dublin-Belfast motorway, you might have noticed the steel installation on your left-hand side. This art project came about through a collaboration between Sticky Fingers, a children’s arts organisation based in Newry and the Arts Council for Northern Ireland. 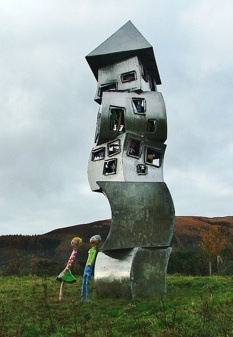 The Tower of Imagination (2011) was designed by artist Maurice Harron to celebrate the children of Newry. The aim of this piece was to bring the creativity and imagination of the city’s children to the wider community. The tall steel structure looks a though large tumbling blocks have been piled up to create a house. Some of the metal blocks have openings of various sizes and one can see colourful animals and friendly monsters peeping out of these windows. A smiling girl and boy standing in front of the fairytale house are looking up in amazement, it seems. When you reach Belfast from the M1 motorway, you can only be mesmerized by the huge metallic sphere looming in front of you. Rise (2011) was designed and created by Nottingham artist Wolfgang Buttress, who received several awards for this piece. No wonder! 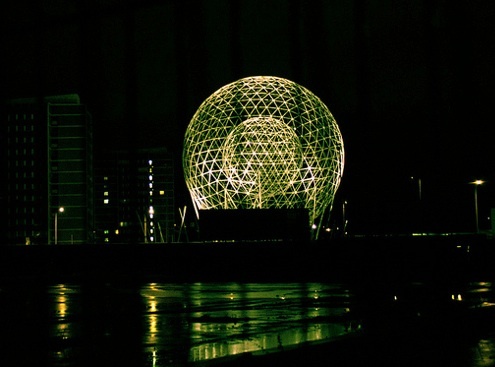 The 40-metre high structure was commissioned by Belfast City Council and conceived as a ‘symbol of unity and welcome’. A small concentric sphere made of steel tubes is suspended within a larger one and the sculpture sits very symbolically above the Broadway interchange. Wolfgang Buttress wanted ‘to create a sculpture that could be seen and appreciated in the round from any orientation – physical, emotional or political’. He also ‘wanted to suggest the universal, so the sculpture has neither a back nor a front. It references the sun and the reeds that were here before us and can be seen as a portal to something less tangible, Buttress has said. At night time, the art piece glows beautifully and you can really appreciate the intricacy of the framework arranged in a triangular pattern. I think it gives Belfast city a truly special sense of confidence and pride.